I am excited to be celebrating my 2nd blogging anniversary today. When I first started this blog two years ago, I had no idea what the future was going to hold. When blogs first started appearing on the internet, I didn’t have a clue what they were about. Just a web log about something or other and basically ignored them. I used the internet to gather information, not to read or browse through someone else’s thoughts or feelings. After I was on the well trained mind boards for while, I was exposed to the homeschool blogs. I actually read a few and thought how interesting. Not really something I could do...had all the excuses in the world popping up. I am not that verbose, our life isn’t interesting enough, why would anyone read it. Then as the blog world matured or maybe as I matured; learning, thinking, expanding my horizons, the thought crossed my mind. Hey, I could do that! Even if it was to keep our families abreast of our daily doings, it would be fun and help my writing skills. Having recently gone back to college, I needed to refresh my writing and thinking skills. It would be a journal of our life. I’ve never been able to keep a written journal for very long. Always too tired to write, to think. But, I was on the computer everyday…doing lessons, reading the news, research, so why not add in blogging. So I figured I would probably write one post a week at max. My very first post after introducing myself to the blogging world at large was about Reading. I have gone from writing maybe one post a week to posting daily, sometimes more than once. As of today, this is my 508th post. I had never imagined I could be so verbose. I'm from a family of 7 and was the quiet one, without much to say....Or so they thought!!! I think blogs are a blessing for introverts - we get to talk without being interrupted. The blogosphere is an amazing place. In the past two years, I have discovered a vast worldwide internet community of bloggers who are diverse, interesting, entertaining, informative, helpful and wise. Very Wise! I discovered a whole new world of book bloggers, author blogs, writers blogs as well as home school and educational blogs. It has evolved or rather I have evolved since then and my blog has become a creative outlet for not only discussing homeschooling, but writing, book reviews, challenges and memes. I have something for you all today, and some folks will be surprised because I don't think they even know I exist - because I lurk a lot. 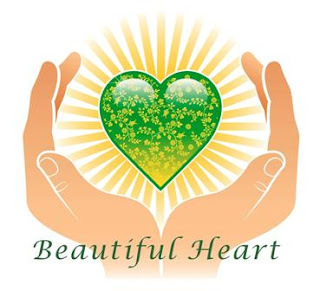 This Beautiful Heart award goes out to all my readers. This includes you too, Mom and Dad. Thank you for all my wonderful readers, my faithful cheerleaders who uplift me with their positive words and spirit. Thank you to all the lurkers as well...I know you are there. This award also goes to all of the bloggers who put their hearts, mind and soul into their blogs and give us a glimpse into their worlds. They are positive and may not realize it, but are leading by example. They inspire with their words, educate and inform. They entertain and uplift with their humor. They are welcoming, helpful and friendly and no one is a stranger, whether you've commented once or a million times. They are ever so wise and giving. Most of all, they have Beautiful Hearts. I am giving this award to all of those bloggers listed on my sidebar, plus some bookmarked ones and a few unsuspecting folk who don't know I read their blogs. I have a tendency to lurk because I don't always have something to say. Without you, I don't think this blog would be what it is today. I have learned so much from all of you. I'll be visiting all this week and handing out the award. There are no rules for this award which means you don't have to bestow it on 3, 5, 7, or 10 people. If you want to pass it on, it is up to you. Thank you for helping me celebrate my 2nd blogging anniversary! Hey, happy blogoversiary, and thanks for the award! I'll post it in my awards link in my sidebar. You have a great blog and lots of great things to share! Happy Blogoversary!! Wow! Isn't it amazing where our blogging has taken us and the unexpected relationships we developed through our words and photos. I will be happy to display this special award in my slide show. What a great idea! So sorry I wasn't here yesterday, but accept my belated best wishes. I hope to be reading your blog for many years to come. Two years? Wow. That's amazing. I can't wait for my first anniversary! Much hugs and thanks to you for not only including me in your sidebar (I get traffic from it), but for including me in this award! I'm certainly going to mention you in my SS post! Happy Blogversary, and thanks for the award! Congratulations on your blogoversary, and thanks so much for the award and your kind words about my site. Keep the great posts coming! Happy blogaversary!!! Thanks for the award!!! Happy Blogaversary and thanks for sharing the celebration. Sending you a virtual coffee and/or wine. Your choice! Happy 2nd blogiversary! So many of us started our blogs at around the same time. My second is in a week. I agree with all you said. This is such a lovely community. Nope, I'm not a lurker. THis is my first time here (arrived via Scobberblotch). Giving an award to your readers? now there's a darn good idea. Makes me wanna come back! So... you gave me an award... but, I gave one right back atcha! Happy Blogiversary! March is obviously a very popular time to start blogging!!!!! :) Thanks for being such a bright presence in the blogosphere! I'm at the start of my blogging life - a babyblogger if you like - but already I agree with so much of what you've said. I'd heard friends talk about blogging but didn't really understand it until my friend Becca of Just one more page showed me the ropes. Now I'm hooked! And really enjoying the virtual world (perhaps a little too much) everyone seems so nice in here where manners & generosity exist in abundance. Happy blogoversary.I've just discovered your blog and look forward to reading more. Happy blogiversary! What a nice thing to do - giving your readers an award. Thank you for your interesting posts and for the award! Congratulations on your anniversary, and thank you for the Beautiful Heart, Robin! Happy blogoversary, Robin! I enjoy reading your blog -- though like you, I often lurk because I don't necessarily have anything to say. happy 2nd blog birthday, and is there any cake left? :-D I just found you through the OUaT3 challenge, and you left a lovely comment on my blog, so I'm back to return the favour, and I've added you to my blogroll. I like how you've named your blog after the two most important people in your life. thank you, thank you, thank you, everyone - I appreciate it and you! I'm amazed Sheri, Nymeth and Amy because I had the impression you guys had been doing this for so much longer than me. :) I have blog envy. Thank you for your kind words and look forward to celebrating your blogoversaries. Wendy - Welcome to the club and we'll be drinking the bubbly in your honor next year. Lillie and Susan - I love first time visitors and am enjoying checking out your blogs as well. Janet - lurk away, I don't mind. Matt - yes book bloggers are the kindest people. Thanks for the Beautiful Heart. I'm going to have to confess that I didn't read your entire post. I stopped at the link to your son's reading and then went on to read more of your homeschooling posts. I'm very fascinated with how well children are doing with mom and/or dad as teacher. Good for you and your husband. Happy anniversary. Blogging is so very enjoyable. How awesome sweet of you! I'll get a post written up and published this week. Wow! You made my day! Happy 2nd blogoversary!! That's amazing, two years??!!! Wow! Congratulations.